In my last blog on DevOps Topic, I discussed “New Breed of Testers with DevOps (Reference -1)” I discussed about evolution of DevOps, DevOps approach, use of tools in DevOps lifecycle and how DevOps has changed the skill landscape expected of test organizations. I received number of enquiries on how should the organizations go about assessing state of readiness for DevOps and then to mature in their DevOps journey. To begin with, lets discuss briefly about why organizations are moving to DevOps and any challenges in doing so. Then I would present a method to assess current state of maturity and a roadmap to achieve higher state of maturity in DevOps journey. DevOps maximizes automation across build, testing, provisioning, configuration management, promotion, deployment and release stages. (3) DevOps Quality Blueprint (QBP) – Why & What ? To understand the current state of maturity of the organization to adapt to DevOps practices is important in ensuring successful implementation of DevOps. a baseline assessment helps to understand the challenges (such as stated above) to be acknoledged and addressed before organization can embark on the DevOps journey, For those who have already embarked on the journey, such assessment helps to progress further in achieving higher state of DevOps maturity. 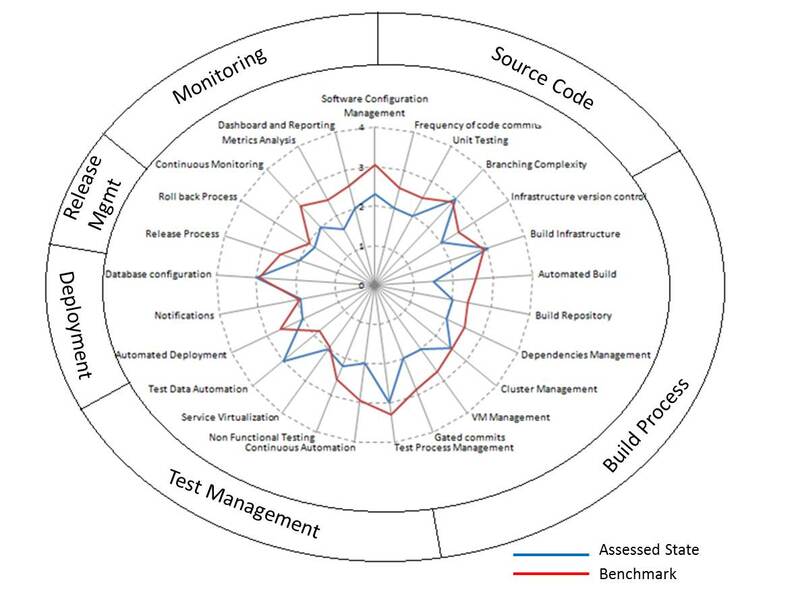 The DevOps Quality Blueprint (QBP) benchmarks the maturity of the testing processes in a DevOps environment and helps us to develop a roadmap for envisioned end state. Capgemini/Soget DevOps QBP approach assesses 25 elements of DevOps adoption across 6 key areas – source control, build management, release management, deployment, test management, and monitoring. With our detailed toolkit for DevOps QBP assessment, we assess current state of each of the practices in 25 elements in 6 key areas. A sample snapshot of the DevOps QBP assessment is provided below. Capgemini Sogeti have a benchmark database of DevOps maturity across industries and domains. Engagement assessments are compared against benchmark as portrayed in the kiviatt chart above. The assessment helps identify areas of gaps, based on which actions are identified for advancing in DevOps maturity roadmap for envisioned end state.